Economic development research, strategy and action planning is a core and large area of SQW’s competence. We work hard and robustly to provide insightful explanation, design innovative strategy frameworks recognised for their coherence, communicability and comprehensiveness, and produce exciting action plans that are rational, viable and sustainable. A key and sought-after feature of our work is the dynamic view we take of economies and their assets, often delivered through our close links with specialised forecasting experts. Our track record in economic development research, strategy and action planning spans supra-regional, regional, sub-regional and local geographies. And we don’t work for clients; rather our approach is to work with clients, recognising that they and their partners will be responsible for taking forward the analyses, strategies, and action plans that we have catalysed. Engagement is key to the way we work, as is our commitment to sharing and transferring our knowledge so that clients are increasingly able to understand and explain their economies. Economic impact studies assess the way in which an initiative or policy, an event or a series of activities affects the local or regional economy. Such research may be conducted as part of an appraisal of options (before a decision is made), or after a project has been implemented – to see whether the effects on the economy are as predicted. There is no single approach, although there are certain principles to follow. For each project the work identifies and then measures the difference that the project makes to employment and GVA supported. Over the past 30 years, SQW has researched the economic impact effects of new roads, buildings, air routes, cultural and sports events, landscapes, national parks, universities and technology. All are based on assessing the difference that the new activity has made to income, expenditure and employment in the local area or region. Much of SQW’s work on economic impact has related to the tourism-related effects of specific events: the Commonwealth Games, the Rugby World Cup, the Ryder Cup, the Edinburgh Festivals and the G8 Summit. Hosting these events can generate substantial short term injections of income into a local economy but this type of analysis needs to be treated very carefully. Some of the apparently new expenditure may have been made in the area anyway. There may be multiplier effects as the expenditure flows through the economy and it is important to consider the possibility that the new activities are ‘crowding out’ others. While most economic impact studies are concerned with the immediate effects, our work is increasingly looking at how sustainable these effects might be. For example, for most major events there is growing emphasis on legacy and the contribution made to regeneration. SQW has managed many international programmes over the last two decades. Most of these have involved a combination of internal staff and trusted associate consultants, with whom we have forged close relationships. Some of these management contracts are undertaken in conjunction with other consultancies elsewhere in Europe, Africa, Asia Pacific and the Americas. Whatever the resourcing structure, we strictly adhere to our quality processes and procedures to produce excellent and reliable outcomes. Fast growing economies, regions and cities tend to be shaped by successful businesses, sectors and clusters. Thriving economies are characterised by high rates of business start-ups, good survival performance and growth, often underpinned by a transition from low to high value added production. Key factors in explaining differences in business performance are an entrepreneurial culture, conductive factor markets and the availability of a supporting infrastructure, hard and soft, favourable to business development and retention. An important factor can be the existence of centres of learning and research as a source of spin-outs and inward investment. Initiatives to enhance business competitiveness are a crucial element in regional development and regeneration strategies. SQW has a long-established track record in assisting clients to support the development and growth of the business sector in general and small and medium sized enterprises in particular. Finding constructive ways to respond to changes in the operating environment is part and parcel of running Public, Private and Third Sector organisations. SQW has considerable experience in supporting a range of organisations to understand and respond to the challenges they face. This experience spans UK and international markets. Areas where SQW can add value to clients include business reviews, re-structures, governance arrangements for partnerships, and succession strategies for regeneration partnerships. Performance management should be an integral part of the policy lifecycle. It should embrace assessment of the rationale for policy intervention, options appraisal, monitoring, evaluation and feedback to facilitate learning about “what works”. It enables the relevant policy and partner organisations to learn, develop and mature. It is, therefore, both backward and forward looking and integrated into policy development and delivery as a management tool. It is not something that is just “bolted on”. SQW has experience and expertise with performance management across highly diverse policy areas. We have been engaged in the design and development of performance management frameworks, as well as the conduct of a wide variety of policy, programme and project appraisals and evaluations. So, we know the practical possibilities and limitations of performance measurement and management and how they should be taken into account when designing, developing and refining performance management frameworks, structures and systems. We are familiar with the methods and techniques for planning and structuring appraisals and evaluations, for obtaining the relevant information, for analysing it and for reaching judgements based on the analysis. Our evaluations typically include an assessment of partnership processes, and their impact on the effectiveness of the relevant programme. We combine a rigorous analytical approach with a concern to provide practical advice and improve the effectiveness of interventions. SQW was contracted by the IFC to undertake a review of the SME Linkages Program. As part of the review, SQW produced a summary paper on Linkages best practice and reviewed four IFC Linkage programmes in depth (involving fieldwork in Azerbaijan, Mozambique, Zambia and Peru) and five others through desk research. The aim was to compare and contrast the various programmes, identify lessons learned, draw conclusions on effectiveness and provide recommendations on how to incorporate best practice into future Linkage programmes. Understanding the current situation in, and prospects for, specific sectors and sub-sectors of the economy is important for national, regional and local government and individual firms. For the public sector at the national level, the intention may be to reshape policy frameworks or guide strategic dialogue with major firms. At the regional level there may be a need to publicise strengths as part of a promotional or marketing campaign. Or there may be a concern to understand particular problems or weaknesses so as to package a set of measures to help smooth the processes of restructuring (e.g. in the light of a major firm’s cutbacks or closure) or to help foster productivity improvements in individual firms, perhaps through supply chain initiatives. SQW has experience of work covering many different sectors. In the high-tech sphere, we have undertaken a series of projects related to biotechnology and biomedicine, including evaluations of assistance programmes, training in entrepreneurship skills, establishment of a regional network and market research for major property developments to serve the needs of biotechnology and biomedicine. Other studies have looked at similar aspects of other sectors, including polymers, electronics, information technology and communications industries, oil and gas. Alongside sectors, clusters have increasingly been recognised as a serious vehicle for economic development. Through clustering behaviour, it has been argued that the competitiveness of firms, and by implication the local economies in which they are based, can be enhanced significantly. However the concept of clusters has frequently been misused. In particular there has often been a slippage between the identification of places as clusters, and the form of business behaviour that is consistent with clustering. SQW has worked within a number of sectoral and geographical contexts in order to explore the scope and potential for cluster building. We have undertaken research aimed at developing the cluster concept, worked with partners in order to develop initiatives that might be put in place to enhance their competitiveness, and we have been involved in helping to implement cluster building programmes. Science parks, innovation centres and related initiatives (such as technology parks, research parks and technology incubators) support the formation and growth of research based or innovative businesses. The Research suggests that they increase survival rates among such businesses by providing access to appropriate property, business and financial support. Science Parks are also important tools in the commercialisation of research, helping to link universities and other research institutions to businesses. SQW is a world leader in work on science parks and innovation centres. Where appropriate, our expertise is complemented by the practical know-how of our sister company, Oxford Innovation, which is the UK’s leading operator of innovation centres that provides innovation advice to businesses. SQW has advised on around 80 schemes in over 20 countries worldwide, including market and feasibility studies, detailed planning, support for start up, review of operations and evaluations of impact. We seek to ensure schemes are designed, developed and operated to suit the specific needs of a locality, and to address the primary objectives of the sponsors. This is often complicated because science parks and innovation centres frequently have multiple sponsors, each with their own expectations and constraints. We identify and address these explicitly, so that the main purpose(s) and focus of each scheme are clear. SQW often takes the lead role in projects, but internationally we usually work closely with local consultants to ensure that international experience is combined with local knowledge. We also often involve people in our teams with hands on experience of running successful science parks or innovation centres elsewhere, so that we can provide sound and practical advice. Our strategy is to provide to our clients, no matter government or private, the very best purpose-built environment in the food and biotech sectors today and tomorrow. The concept for the agri and biotech parks development is to utilize the country’s unique natural flora and their potential use in food, pharmaceutical and ‘wellness’ products to contribute to the economic diversification and employment. The plan and strategy will provide a framework that is safe, sustainable, stimulating and efficient. To achieve this, broader and more integrated approach is essential. In the past few decades, our works cover a wide range of locations in the world. Our sites attract critical mass of businesses and academic institutions involved in R&D and its commercialisation has created a rich seam of specialist skills in the food and biotech sectors. It is increasingly recognised that Information & Communication Technology (ICT) has important effects on the productivity of economies. Solow’s paradox – “You can see the computer age everywhere but in the productivity statistics” – has been convincingly countered by recent studies that indicate a substantial and growing economic impact of business adoption and usage of ICT. In recognition of this, policy makers around the world are seeking to design ICT policies and programmes that have a significant positive impact on business productivity; to evaluate the effectiveness and value for money of their interventions; to narrow the ‘digital divide’ between sections of our communities; and to nurture ICT industries and clusters. SQW has extensive experience in advising clients in this field – in respect of both ICT as an enabler and ICT as an industry sector. We assist our clients to identify where market failure exists, to develop or appraise rationales for public sector action, and to develop or evaluate specific strategies and activities. SQW was commissioned to undertake this pan-European research and dissemination project which is focused on local and regional initiatives for promoting energy efficiency through the direct and enabling roles of Information and Communication Technology (ICT). It involves the preparation of case studies, guidance and a wiki resource. SQW leads a partnership with ICLEI and the Regional Environment Centre (REC). Our masterplans are built on our insight into the way places influence economic, culture, work and lifestyle, interconnected factors such as information, transport, waste and climate. We adopt a top down approach from macroeconmic to micro factors with tools and analysis that interact to the quantifiable and subjective aspects of economic, spatial, social, environmental and cultural context. 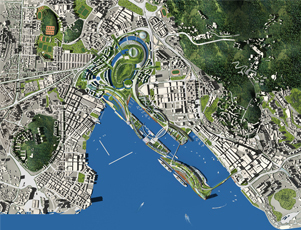 Our approach is demonstrated in our masterplanning tasks of the BioInnovation Corridor of Brunei, the Land Transportation Masterplan of Brunei, our work on the Hong Kong Science & Technology Park, the Masterplans of the Beijing and Tianjin Logistics Development. Our approach to transport strategy and planning is aiming to propose an integrated, high quality, rapid, efficient and safe transport service network that can ensure sustainable, equitable and uncongested mobility and connectivity. The plan and strategy serve as the basis for policy making and in particular to government’s preparations towards a comprehensive national development plan. In each case we will address the Issue and Challenges, define the baseline situation; develop a suitable Transport Strategy to meet the future vision requirement. We will also provide an Implementation Plan to detail out the steps, procedures, policies, funding and physical infrastructures that are required in implementing the identified transport strategies. The interplay between the health agenda and sustainable development presents many opportunities for pursuing the goals of improved public health and economic and social progress. Adequate health care infrastructure is essential for sustainable development, and the planning of this infrastructure needs to be integrated with planning for other public services. There is a renewed interest in the alignment of the public health and sustainability agendas and in the concept of ‘healthy, sustainable communities’. Health care organisations, through their employment and procurement activities, have a significant impact on their local economies, and this has led to an awareness of the NHS as a ‘corporate citizen’. The NHS also has a major commitment to teaching and research, and is a major player, in partnership with higher education, in knowledge production and transfer. As health care becomes more pluralistic and devolved many health care organisations are seeking to better understand and strengthen connections with their local communities and, in the case of larger providers, establish their credentials as regional development players. SQW is increasingly providing support to health and health care clients. We can offer an unrivalled ability to bring our wide perspective of economic and social development to bear in supporting NHS clients, private health care organisations and other clients who wish to better engage with the health sector. We can help clients navigate through the complex web of agencies and interests in health which is increasingly seen as ‘everybody’s business’. Areas in which we have a particular interest are health and infrastructure, healthy places, health and sustainability, health and enterprise, health and education, health and skills and the NHS as a corporate citizen. The contribution of research to economic development is widely recognised at national and regional levels and this has been one of SQW’s specialist areas since the firm was established. In the UK, and many other countries, the higher education sector has a key role in both undertaking research and training researchers and we have a similarly long established track record of work for, and with, the sector. Higher education institutions, however, have a much wider role than research alone. They contribute to the social inclusion agenda through widening participation and they have assumed increasing prominence in knowledge transfer initiatives in recent years, while retaining the key function of producing highly trained graduates and post graduates. Our work with the sector reflects these roles and encompasses teaching and learning, organisation and strategy development and planning for new and extended provision, as well as research. Our clients are diverse and include: government departments in the UK and abroad; the higher education funding and research councils; international agencies and individual HEIs and public sector research establishments. We have undertaken feasibility studies and evaluations of a wide range of policies and programmes, advised on knowledge transfer and commercialisation strategies, assessed student demand for various forms of HE provision and advised on processes for allocating funds. The development of a more highly skilled workforce, and a greater attachment to learning among the population as a whole, have become central tenets of the government’s drive to generate an increasingly competitive economy. Key aspects of this policy thrust are: (i) the emphasis on increasing qualification attainment and rates of participation in post-16 education and training among young people, with a concomitant increase in participation in higher education; and (ii) the aspirations embodied in the Skills Strategy to enhance the skill levels of the existing workforce, and especially those with few or no qualifications. SQW can contribute to research, evaluation, policy formation and more effective practice related to skills and learning through its expertise. The improvement of public services is a major theme of government policy. It has involved better performance management, organisational reform, new working practices and cultures, greater use of e-services and experimenting with new forms of service delivery, including the engagement of the private sector and joint working between public agencies. SQW has worked with a number of government clients to evaluate new approaches to public service delivery and identify practical and deliverable changes to enhance its effectiveness. We have also developed an understanding of the particular challenges that public agencies face in areas of multiple deprivation, where needs are often greater and remedies more complex. Our work has explored how public services can become more responsive to local needs through the more active engagement of service users and communities, including the development of new forms of local and neighbourhood involvement and governance. Government policy to regenerate our deprived urban and rural communities has evolved and become more sophisticated in recent years. Today’s approach recognises the need to secure the social and economic inclusion of individuals, the need to tackle multiple deprivation with area-based programmes and the importance of regional and sub-regional investments in revitalising local economies and housing markets and building new communities. Partnerships – building, supporting and reviewing local partnerships and developing local stakeholder involvement, for neighbourhood partnerships and Local Strategic Partnerships. Neighbourhood governance and management – working with local authorities and partnerships to explore new ways of improving services and local government at neighbourhood level. SQW has national expertise in the development of neighbourhood management approaches. Mainstreaming – developing and reviewing strategies and programmes to tackle area-based deprivation, including the bending of mainstream public services to deprivation objectives, including through Local Area Agreements. Evaluation and performance management – strengthening local baselines and performance management frameworks for LSPs and other partnerships, mapping local resource flows and evaluating the impact of interventions. SQW has unrivalled experience of providing clear evidence and intelligence to improve the targeting and management of neighbourhood renewal programmes. Our neighbourhood renewal experience is also often integrated with our work on promoting local economic development, lifelong learning and physical regeneration. SQW has a strong track record of undertaking research concerned to address issues of social inclusion and equality. Many of SQW’s projects are concerned with evaluating programmes and strategies to address the factors that contribute to the barriers that disadvantage groups both in the labour market and in communities. In addition to disadvantages linked to poverty, unemployment and low incomes, certain groups also experience discrimination in the workplace, in the community and as users of services, which prevents them fully participating in society. SQW has recently conducted research examining innovative approaches to addressing issues including gender inequality at work, and barriers to independent living for disabled people. Equality issues are currently high on the UK public policy agenda in the lead up to the establishment of a Commission for Human Rights and Equality. SQW can deliver a wide range of assignments concerned with the social inclusion and equality agenda. Some recent examples are set out below. Formulate tourism development plan and strategy with emphasis on policy and strategy, planning, institutional strengthening, legislation and regulation, product development and diversification, marketing and promotion, tourism infrastructure and superstructure, economic impact of tourism and tourism investment, human resource development, and socio-cultural and environmental impacts of tourism. Our approach is to define different tourism development scenario and formulate Tourism Development strategy and masterplan. Based on the strategy and masterplan, we will provide technical assistance to the Government and clients in implementing the priority recommendations of the strategy and masterplan. The tourism policy is formulated through a consultative approach involving all stakeholders. Prepare policy recommendations which encompasses a detailed review and assessment of the current tourism scenario, identifies policy constraints and challenges, and, identifies opportunities and benchmarks for the future growth of the industry. Organize a series of regional workshops to disseminate the draft recommendations to public and private tourism stakeholders to ensure that current and future needs of the clients need. To advise the public and private sectors to develop a festival or event to celebrate community identity and showcase local talent and achievements. The events will also serve to promote the country as a destination for Foreign Direct Investment (FDI). The festivals and events can draw tourists to the community and help the development of the downstream and upstream sectors.